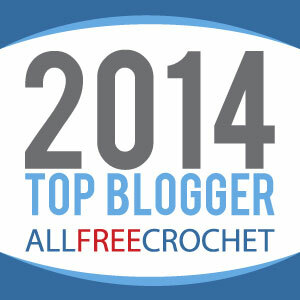 I’m excited to announce that I was named one of AllFreeCrochet’s top bloggers of 2014! They compiled a list of 100 of their most popular patterns of the year, and I made the cut! My Amazing Grace Snoodie pattern was featured on the Top 100 Patterns list!! I am so honored to receive this award and it is all of you who support me who make this possible!!! Thank you and All Free Crochet!!!! Stay tuned tomorrow for the Material List for our Crochet with Me ~ Winter CAL!!!! Congrats! You truly deserve it, your designs are all beautiful! Congratulations! You deserve the award!!! Congratulations!!! You have such pretty patterns! You have worked hard and deserve it! Enjoy!!! Congratulations! This is wonderful news! I really love so many of your patterns. Many of them deserved to make tha cut! I fond of the baby blanket you released this year. The colors are stunning. Love the headband too.